Counterfeit $100 bills were used at two businesses along South Street, according to Sojourn Philly. Counterfeit bills of varying denominations popped up at businesses in South Philadelphia over the weekend. Rex 1516 and Jet Wine Bar, both of the restaurant group Sojourn Philly, say they were hit with fraudulent $100 bills on Saturday, the Passyunk Post first reported. Amanda Juner, a bar manager at Jet, confirmed on Tuesday that a customer entered the restaurant around 8 p.m., ordered food and then paid immediately. The customer took the change and left, never having picked up the order. Another counterfeit $100 bill was used at Rex 1516 round 8:15 p.m. The restaurant group believes that two men were involved. The restaurants are located across from one another on 15th and South streets. The two $100 bills were checked with a counterfeit pen but passed the test, Juner said. 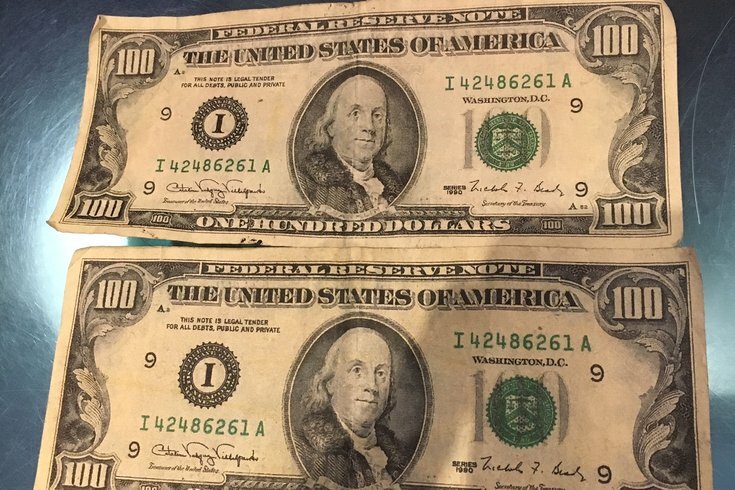 Becoming suspicious, the restaurants compared the two bills and noticed they had the same serial number, I42486261A. Each U.S. note of the same amount has its own serial number, according to the U.S. Department of Treasury. "The biggest tell on the bulk was the micro-printing around Ben Franklin, on which you can't discern the 'United States of America,'" a spokesperson for the group wrote in a statement. A spokesperson for Sojourn said that it has not yet contacted the authorities but intends to. An employee with a Rita's Water Ice along South Street said that two counterfeit $20 bills were used on Saturday. Police and the Secret Service said that they did not receive any calls over the weekend involving counterfeit bills in the Philadelphia area.